OK so I have to admit this Sizzix 3D Cake die has been a bit of a roller coaster for me. At first, I was so excited to get it. Then I tried to use it in my Cuttlebug (which it’s not really made for but it does work if you do a lot of tweaking), and I hated it. Finally, I saw this card today and Jan inspired me to give this project another go. First I cut out all of the pieces for the cake using the 3D Cake Die and assembled it as per the instructions. I used Georgia Pacific white cardstock for the template pieces and Chocolate Chip DSP for the strips around the cake layers. 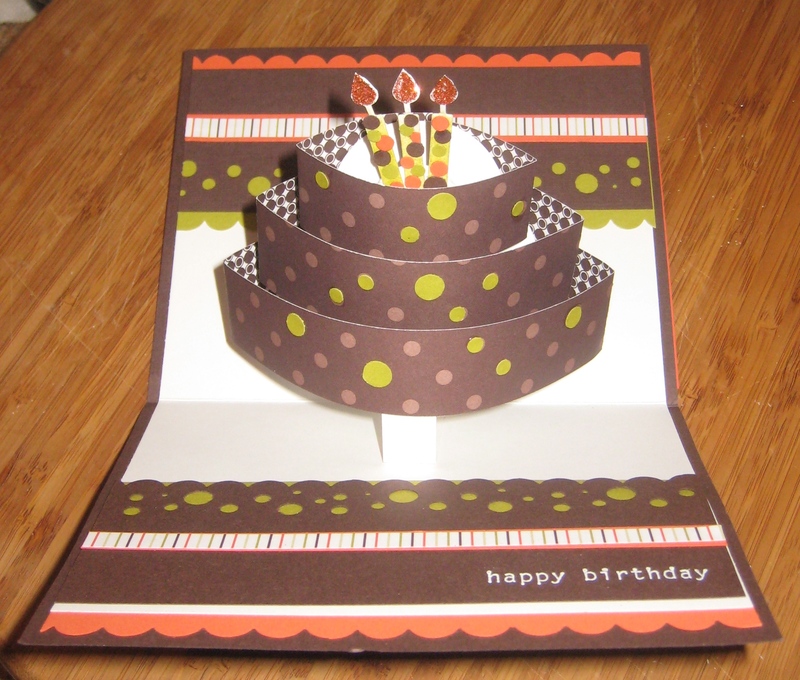 The cake is mounted on a piece of 5 1/2″ x 8 1/2″ GP white cardstock, folded in half. 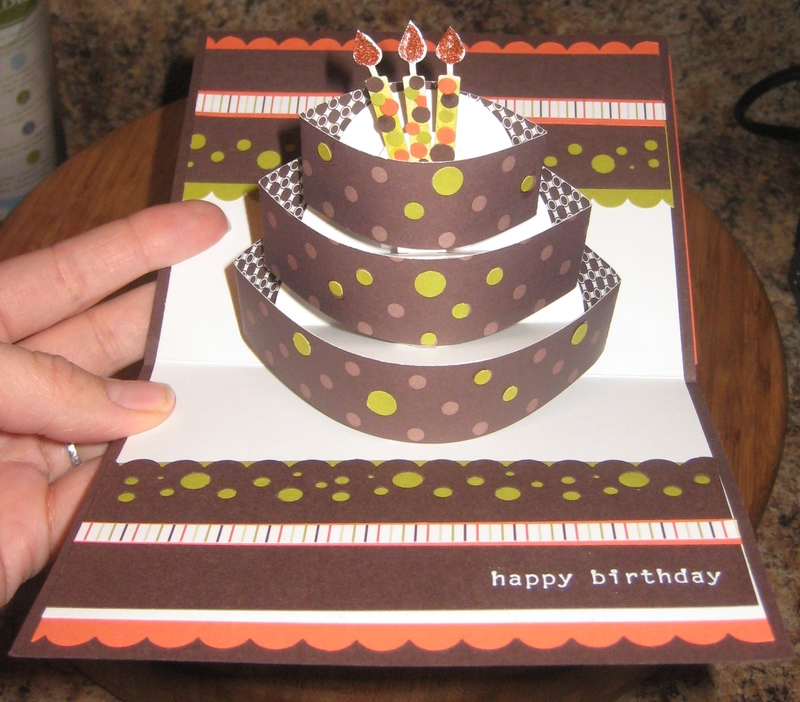 Then, I glued that piece of white cardstock to a 5 3/4″ x 9 1/2″ piece of Textured Chocolate Chip cardstock, folded in half. 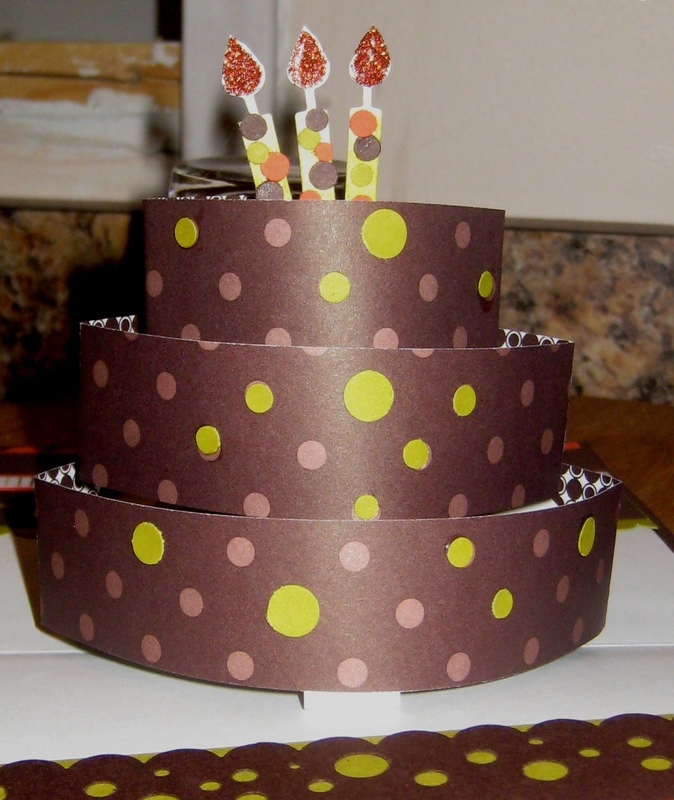 Next, I decorated the top and bottom edges with Kiwi Kiss, Tangerine Tango, and Chocolate Chip cardstock. The striped paper is Hawaii Papaya DSP. I used the Scallop Edge Punch and the new EK Success Border Punch “Swiss Cheese”. I stamped “happy birthday” from last year’s SAB set Birthday Whimsy in White Craft ink and embossed it with White embossing powder. The candles were sponged with Kiwi Kiss ink first, then I glued some of the little dots that were punched out with the EK Success Swiss Cheese punch onto the candles. Finally, I used the Orange Supernova Fine Glitter on the “flames” with 2-way Glue and adhered the candles to the cake using Sticky Strip. I added some Kiwi Kiss dots to the cake using left overs from the Swiss Cheese punch. Lastly, I decorated the outside of the card. I used a piece of Tangerine Tango cardstock, 5 3/4″ x 4 1/4″, Chocolate Chip DSP 5 3/4″ x 3 3/4″, and adhered them to the card front. The strip across the front is Kiwi Kiss punched with the Scallop edge, chocolate chip, and a strip of Hawaii Papaya DSP. 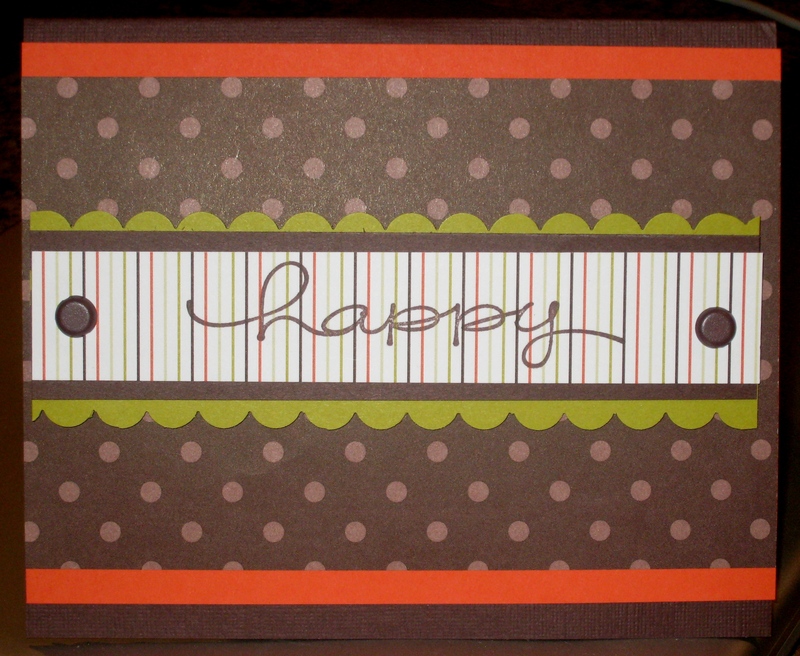 I stamped “happy” from Happy Everything in Chocolate chip ink, added two 5/16″ Basic Jumbo Brads in Brown, and adhered that to the card wih dimensionals. Lisa, I am so glad you gave it another try. The cake is adorable! I love the colors…never would have thought of that combo! I love chocolate cake! yes l tried it with my cuttlebug and hurrah it worked! its a delghtful card isnt it, l love it, l made mine for my husband, it was well woth the try!